Cleveland Tramrail was acquired in 2002 by Gorbel, Inc. The brand has been an icon in the overhead material handling world since the early 1900's and the product is as important and viable today as it ever has been for the right applications. 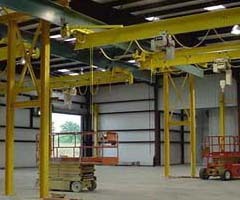 Met-Con Crane Division can assist you with parts and new system designs for your projects. 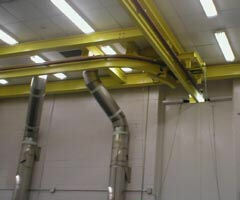 Tramrail is a patent track (or patented track) profile that resembles I-beam. The important difference is that the rail is manufactured from high carbon alloy steel joined by a carefully controlled welding process which means greater strength, higher rigidity and greater load carrying capacity and safety. The lower section flange is rolled from high carbon billet and welded to a structural steel web and top flange. The result is increased load carrying capacity with easier movement and the raised profile prevents peening resulting in increased track life. 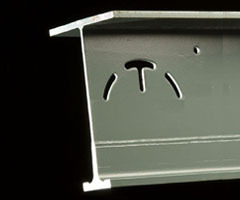 One of the most useful design features of Tramrail patented track is uniform width which is maintained over a wide range of beam depths and carrying capacities allowing standardization of trolleys, end trucks, interlocks for monorails or bridge interlocks, electrification attachments and other accessories. The precision manufacture of Cleveland Tramrail allows more accurate and faster installation.